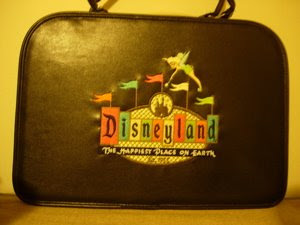 This is a Disneyland 50th Anniversary Pin Case, designed by Shag, featuring Tinkerbell and the old Disneyland Marquee. It's a beautifully designed pin case, and it will hold lots of pins and pin supplies. Pin traders usually will store their valuable pins in one of these. Sometimes they will use a case like this to take to Disney Pin-Trading events, which are held at the Disney Parks and Resorts.